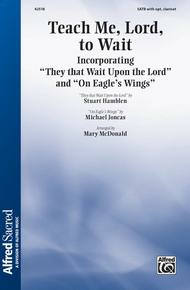 Teach Me, Lord, to Wait (Incorporating "They That Wait Upon the Lord" and "On Eagle's Wings"). Arranged by Mary Mcdonald. Choir Sacred. SATB choir. Choral (Sacred); Choral Octavo; Worship Resources. Alfred Sacred. Sacred. 12 pages. Published by Alfred Music (AP.42518).This unique pairing of two well-known songs is truly inspired. Mary McDonald has created a beautiful anthem that celebrates God’s sovereignty and promises of care and renewal. The melodies soar and then gradually reach a satisfying conclusion.